The painting was "discovered" in a dark back passage of the Palazzo Pitti in 1895 by William Blundell Spence and is now in the Uffizi. The painting was commissioned by Lorenzo di Pierfrancesco de’ Medici (1463-1503) as decoration for a room in his town palazzo. The iconography has been debated and the female figure has been alternately described as "Camilla" or as a representation of the city of Florence, "Florentia." It probably does allude to good government. 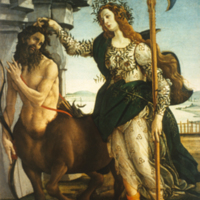 The Neo-Platonic world picture, in which Reason plays a mediating role in the conflict between body and spirit, forms the background to many allegorical representations, such as Botticelli’s Minerva and a Centaur (ca. 1482-3; Florence, Uffizi). Sandro Botticelli (Italian painter, ca. 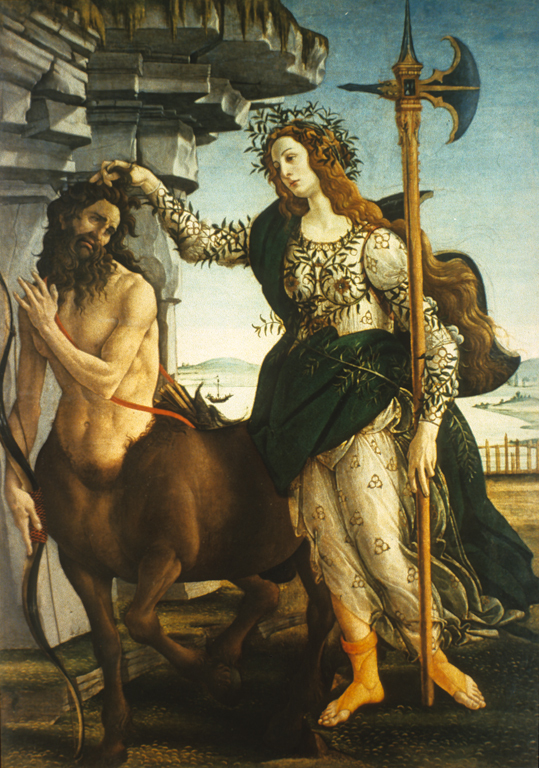 1444-1510), “Pallas and the Centaur,” Institute Images Online, accessed April 24, 2019, http://westerncivart.com/items/show/2772.